YouTube is most popular video sharing site which offers a wide range of useful tutorial videos, interesting movies and other great videos, etc. in FLV format. And you may encounter some trouble when you’d like to download some YouTube videos to your Mac or PC so as to play or edit these videos with QuickTime since there is obvious incompatibility between YouTube and QuickTime. So how to solve the problem on playing YouTube video on QuickTime, this post will show you the effective solutions. QuickTime is an extensible multimedia framework developed by Apple Inc., capable of handling various formats of digital video, which has been prevailing in enjoying videos because of its multifunctional features in video playing, recording, trimming, splitting and sharing etc. However, it mainly supports MOV and some MPEG formats such as MP4, M4V etc. and most of other common formats like FLV formatted by YouTube videos will not be supported in QuickTime. Therefore, to play YouTube videos in QuickTime, it is necessary and important to convert YouTube to QuickTime. Fortunately, there are some useful solutions available here and the most prevailing way for YouTube to QuickTime is to use YouTube to QuickTime converter. As the most famous video sharing website with numerous kinds of video resources, YouTube does have a large amount of users. To download YouTube videos more effectively, Leawo Video Downloader is offering efficiency and convenience. It is not just a single online video downloader, which can not only download online flash videos at high speed but also download videos from YouTube and many other video websites like Facebook, Dailymotion and so on. Moreover, Leawo Video Downloader offers built-in browser and player. To download YouTube video efficiently with this application software, you can follow the steps below. And first you need to download and install Leawo Video Downloader on computer. Enter “Download” panel and paste the URL of the YouTube video in the address box. Then you can simply watch the video with the built-in browser, or you could make use of the IE browser to browse and download YouTube videos when necessary. Click the green arrow on the right side to open the wait-to-select panel where will list all options of target videos in a queue. You can choose one you like and click the download icon to download the selected YouTube videos. When downloading you can still play the video or pause at any minute you want. And downloading videos is listed in downloading panel while downloaded videos will be kept in the “Downloaded” panel for you to watch and manage. Since there are so many diverse video formats developed by different manufactures and the coming incompatibility often disturbs users at the same time, a lot of video converters are designed and popular on the Internet so as to solve the problem. And Leawo Video Converter would be the most prevailing and popular one which empowers users to convert video and audio files contained in more than 180 formats from one to another, so does YouTube to QuickTime. Moreover, this Video Converter can work very fast as well as keep the original quality of the source video while converting YouTube to QuickTime. And its simple operation application makes users save more time and energy when making use of this YouTube to QuickTime converter. 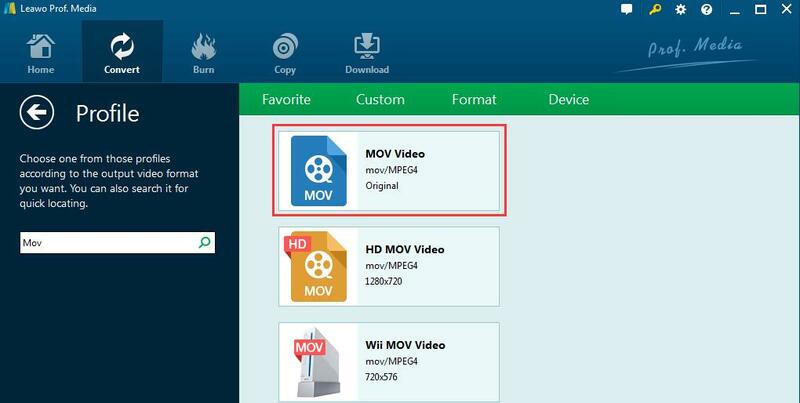 Since QuickTime supports MOV format, you need to convert YouTube Video to MOV beforehand, here comes the step-by-step guide. First you need to simply download and install Leawo Video Converter on computer. STEP 1: Launch Leawo Video Converter and enter the main interface. 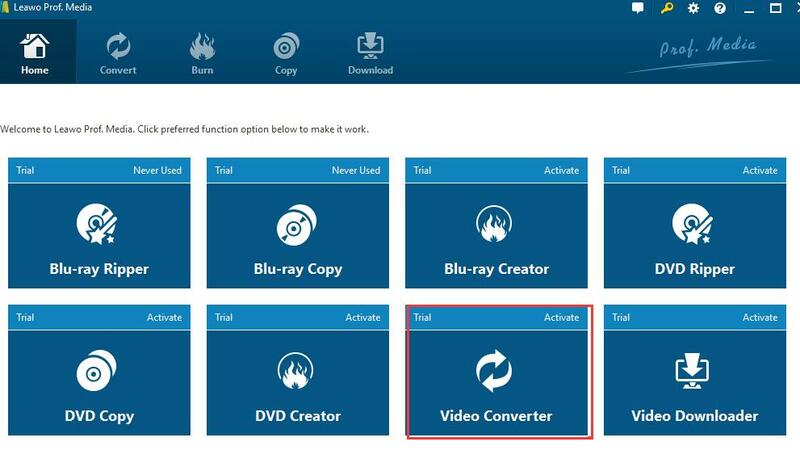 After installation, open this application and choose Video Converter to enter the main operational interface. You should click “Add video” or “Add Video Folder” to upload the targeted YouTube video or video folder to the program, or simply drag and drop the video to the program. In the middle of the top bar，you can click it and go to the drop-down box, then click “Change” button to enter the “Profile” panel where you could select MOV as the output format from “Format” group or simply search MOV directly in the left search box. Return to the main screen to enter the “Profile Settings” interface by clicking “Edit” on the middle drop-down box. Then you can adjust the video parameters of the output MOV profiles, such as Video Codec, Resolution, Bit Rate, Frame Rate, Aspect Ratio, etc. Back to the main screen and click on the big green “Convert” button to pop up a sidebar where you can set the directory to save the output video files. After that, click “Convert” button at the bottom of this sidebar to convert YouTube video to MOV for QuickTime in a few minutes. When the process is complete, click “Finish” and the converted MOV videos will be saved to your directed place in your PC. And now you can play YouTube Video to QuickTime as you like. And if you would prefer YouTube to QuickTime converter Mac free software since you are Mac users, Leawo Video Convert for Mac version is also available. Except for helpful and great YouTube to QuickTime converter application software, there are also some converters online for free with which you can just convert YouTube to QuickTime on the particular website. Zamzar would be one of the most prevailing free converters online which is capable for converting YouTube videos to MOV so as to be compatible with QuickTime. The easy operation approach to convert YouTube to QuickTime by using this free converter online in simple steps as follows. 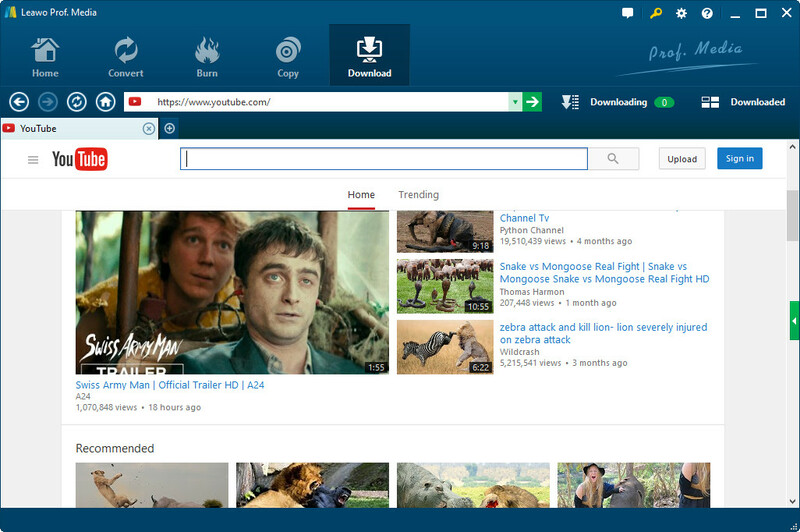 STEP 1: Upload the YouTube videos to this online converter. Here you are required to upload the YouTube videos or the URL of the targeted video to the online converter. STEP 2: Choose MOV as the output format in the drop-down box. STEP 3: For receiving and keeping the converted video in safety, enter your email address in frequent use. STEP 4: Click “Convert” and the YouTube video will be converted to QuickTime MOV very quickly and sent to the offered email. At last, you can download the MOV video from the email and play it in QuickTime as you like. In conclusion, Leawo Video Converter mentioned above works best as a YouTube to QuickTime converter, while its related Leawo YouTube Downloader also provides more convenience in enjoying YouTube videos. What’s more, YouTube to QuickTime converter online free like Zamzar offers great help to some extent. So you can convert YouTube to QuickTime as skillful as possible by following the guide above.